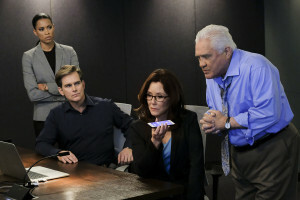 As Major Crimes prepared to film the two-part finale to season 5, there was some question whether what they were filming would be a season or series finale. 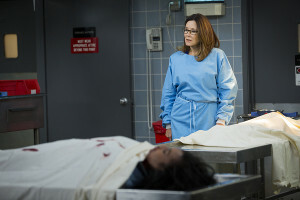 Several versions of the script were prepped by the writers, and just days before filming on the “Shockwave” arc began, TNT renewed the show for season six, and tonight the season finale of Major Crimes airs at 9pm/8c. In part one of our interview with series creator and writer of tonight’s episode, James Duff, he discusses in what ways the late renewal affected tonight’s season finale, and how it feels to be celebrating a combined 200 episodes in the world and characters of The Closer and Major Crimes. Stay turned for part two of our interview tonight, after the episode airs. MajorCrimesTV: Last week’s episode was a real nail biter, and going into tonight, I have a lot of questions about what’s going to happen. And in terms of bad guys, it seems like Christian Ortiz rates right up there with some of the biggest foes the team has ever faced, right up there with Phillip Stroh and the Chris Wood character from the Poster Boy arc a few years ago. Was that an intentional choice to just put everything into this character and story? 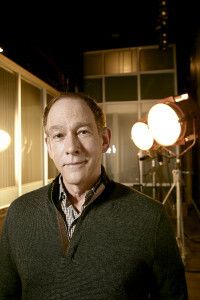 When we last spoke to James Duff at the beginning of season five, he alluded to how the theme of this season of Major Crimes, balance, would have repercussions for everyone in the team. 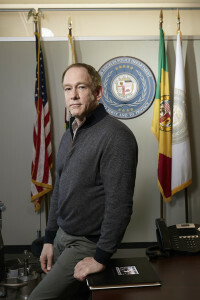 As the summer season wraps up tonight with part three of the summer finale, we caught up with Executive Producer James Duff to shed some light on some of the biggest changes we’ve seen so far this season (RIP Chief Taylor), and what we can expect both in tonight’s finale, and for the winter season of Major Crimes, and beyond. MCTV: I would be remiss to start this off without asking about Taylor, and the shocking decision to kill him off in part one of this three-part summer finale. What lead you to making the decision to have Taylor’s death be such a catalyst in this arc, and as part of the season as a whole? James Duff: There’s two things to discuss with this. Part one of that is, opening Taylor’s office was always my plan, so that was always going to happen at some point. Part two is that balance is the theme of all thirteen summer episodes – it links them all together. I couldn’t do a study on balance without including the balance of power, and without completely removing the balance of power and forcing a new center of gravity into the circumstances around which Major Crimes revolves. And this new center of gravity that the team is now looking to f ind is going to be the subject of the next eight episodes–how we adjust to changes, who becomes the center, and how everyone must adjust to accommodate that new center. History itself is the story of a succession of one center of gravity replacing another, and how people must adapt constantly to that sort of change. People either adjust, or they crash and burn. That’s just how it works. And so, Major Crimes is adjusting. And that will be the back eight episodes we’ll see this winter. That’s always what I meant to happen. And beyond that, there is a world beyond the adjustment of gravity, and so that would be our next season, if we end up getting one. It’s also important to remember that the LAPD is a dangerous place to work, and police officers have an extremely dangerous job in this day and age. The Los Angeles Police Department trains hard to do the right thing, and to bring policing into the twenty-first century, but it’s still every bit as vulnerable as the bad police departments are. There’s no discrimination, apparently, between good police officers and bad police officers. Taylor also encompassed the essence of the blue/black divide, because he’s both. And both sides are damaged by this divide. And I’m not taking sides, I’m just dramatizing the divide that exists, and he was a very good way to dramatize that nobody wins when violence is the answer. So Taylor’s death accommodated the two things I needed. One was to explore the balance of power and how it affects our daily lives, which is what part two of the finale was about. But, any meditation on the balance of power in our human life would require us to take into account religion, and its force in the world and on our leading characters. So both of these major events, Taylor’s death, the shooting of Dwight Darnell, the balancing of what we owe to our spiritual selves and what we owe to our professional selves, all of that was meant to create special circumstances for Sharon Raydor. And I think we did that. MCTV: Speaking to that examination of religion, last week was a departure for the show, in that it both took on a different structure in how it was framed from Sharon’s confession, but also gave us a much closer look at Sharon than we’ve seen for a while. There has been hints that Sharon has this strong religious part to her, but this was the most overtly we’ve seen it, and also gave a bit more insight into the state of her relationship with Andy, and what she feels like she can and can’t talk to him about. JD: To be clear, it’s not that she can’t rely on Andy to talk to, it’s just as she says, she can’t rely on Andy to talk to about the death of Dwight Darnell. And truly, she couldn’t rely on a lot of the audience, either. A lot of the audience would tell her, ‘Look, you did the right thing. Get over it.” I heard that from people after the episode aired. But taking a human life is complicated, no matter the circumstances. For example, with the military, we have 20 veterans a day committing suicide, and a lot of it has to do with loss of life they are involved in. We train people to believe that murder is wrong, and then we send them out to kill people, and don’t understand why they’re confused afterwards. And so I thought it would be important to show Sharon in a moral quandary – wanting to feel grief for having stopped Dwight Darnell from killing anybody else through violence, which she’s always been hesitant to use, unless absolutely necessary. And she’s never killed anyone, and I wanted to explore that aspect of her personality. Also, she’s very Catholic. That has been mentioned throughout the series. She was so Catholic she didn’t divorce her husband for over thirty years. She loves angels, that’s an established fact, and she sent Rusty to a Catholic school. She’s been very serious about her religion, although, this is a murder show, not “True Confessions” or anything like that, so we just haven’t seen it more than that. But if she and Andy were to perhaps want to do something more than just live together, that would create conflict for her. And so maybe there’s a reminder there, maybe I’m setting something up for the future, by reminding everybody about how Catholic she is. MCTV: Going back to Taylor for a moment, we’re heard through some casting announcements that we’re going to see the power shift, and we’re going to see some new people come in to be in the running for his job. Are we going to get closure on the loss of Taylor at all, and the impact that death itself has on the team? JD: Well, we will be talking about Taylor for ages to come. And there is an attempt to honor him in the summer finale in the first act. Not at a funeral, because we’ve already done that, when we went to the funeral of the Chief of Police. I don’t want to give away too much, but he will not be gone completely. He’s a member of the Major Crimes family and he’ll be treated that way throughout. MCTV: In terms of the power vacuum, the Sharon of a few years ago had a lot of desire to move up the ranks. 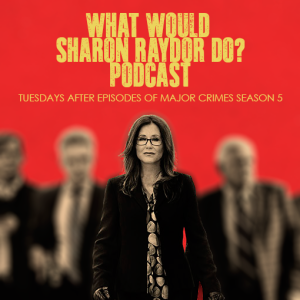 But now that we’re seeing this job having opened up, it’s hard to envision Sharon wanting to leave Major Crimes now that she’s established this great team, and everyone works together so well. How is this power vacuum going to affect her, in a desire to move up the ranks, or lack thereof? JD: It’s a delicate dance inside the LAPD when one of these positions opens up. If you get considered for a promotion, you have to try to get it because if you fail, you’ll lose what you have. And that happens all the time. It’s an unfortunate circumstance, but when new people move in to positions of power, then the people underneath them, who were also trying to get that position of power, end up with a lot of ‘freeway therapy’. They get transferred to Harbor Division or they end up at SOB (Special Operations Bureau) or teaching at the Police Academy. So in terms of a career path, it’s dangerous. On the other hand, you don’t get to decide this. The Police Chief job is decided by the Mayor in concert with the city council and the police commission. The job of Assistant Chief is decided entirely by the Chief. There’s no one else to ask. So if he interviews you, and everybody knows you’re up for the job, then you’re exposed. That’s why we’re bringing on Camryn Manheim, and another actor I can’t announce yet, to all be in play for the job. But the struggle to replace Taylor, will also be a struggle to protect Major Crimes. Because a new Assistant Chief comes in, and the division changes. So Sharon is given a lot to think about in these back eight episodes this winter, and that influences how she has to react to being considered for the position. MCTV: Switching just quickly over to Buzz, and his journey this season. We saw last episode that he’s really stepped up in this investigation and come into his own. Are we going to see more of that now that he has had a taste of being part of this side of the police work? JD: Well, you’re going to see his realization that things are not over. That’s going to come back. So the conclusion of Buzz’s story is both final, and ambiguous. 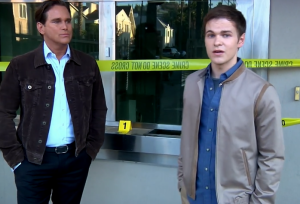 And Phillip has done an amazing job this season, and in the last scene of the case, he does an amazing job, and in the scene after the case, he does an amazing job. And also stepping up and showing he’s capable has been Julio Sanchez, as a foster parent. And we’re going to see just how much this new experience has meant to him in the finale. MCTV: Finally, you mentioned that a potential season 6 would have a focus around the adjustment to whoever becomes the new chief, and how that appointment could change Major Crimes. There hasn’t been an announcement yet for season 6 from TNT. Any updates there? JD: It’s impossible to know what the network consider their needs to be right now, and I can’t say for sure anything. They have not indicated a pickup for next season to me yet, so I really don’t know. I’m very happy overall with how we’ve managed our numbers this season, especially given the switch to 10pm. We did much better than we thought we would do and I think better than TNT thought we would do. It’s a bit of a win-win for us and hopefully the network will want to solidify their gains here and do it again. The summer finale of Major Crimes airs tonight at 10pm/9c on TNT. 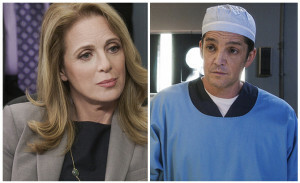 Over the years, DDA Andrea Hobbs and Dr. Fernando Morales have become valued parts of the Major Crimes team, and massive fan-favorites along the way. We chatted with Kathe Mazur and Jonathan Del Arco to find out just what makes their characters tick, and what all that sass is really about. MajorCrimesTV: You guys are just about at the halfway point of filming for this season – how’s it all been going? Jonathan Del Arco: I think we’re having an amazing season this year. I feel like the work is getting deeper and deeper for all of us, in different ways. And from my end, the work we do aside, I have gratitude to the fans right now for having continued to find us. The times keep changing, and you guys find us, the days change, and you find us, and I feel like that fed a lot of our enthusiasm to come to work, and the writers to write, and James to do all that he does because he knows you guys get it. And so, it’s very gratifying. Vis-a-vis the ratings and the fact that we’re crushing it, as it were, that way makes me very happy. Kathe Mazur: I agree! I couldn’t have said it better. MCTV: It seems like this move to 10pm this season has allowed the show to change tone a little bit, and allowed the show to explore some things a little more deeply. KM: Well, to me, the very best of life is when you’ve taken an obstacle or something that you thought was going to be a problem and somehow it ends up creating a whole new opportunity. I think that in the work, and I think that in everything, that that’s the highest level because life is filled with obstacles. So, the thing that keeps amazing me about this crew, is that no matter what the obstacle is, it sort of ends up leading to something fantastic and unexpected, and I continually am amazed at how at every single step along the way of this journey that has happened. JDA: We all have had our share of anxiety about the change, because we were in the same time slot for so long. But, we have such great leadership in James Duff and Mike Robin, and we were all encouraged by them early on to say, “You know what? Let’s just hit it out of the ballpark and have the best year ever, and just focus 100% on creating an amazing work.” A “if you build it they will come” mentality. And it’s so great to actually see that happen, and it’s so rare, because television is not being viewed as much as other mediums these days, so it’s great to know that we were able to meet the challenge, and we were able to bond together to get through it, and here we are! It’s been fantastic. We’re very lucky. 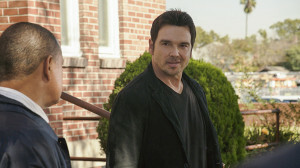 This season on Major Crimes has seen Buzz and Rusty team up to reopen the unsolved murder of Buzz’s father. Through both storylines in episodes, as well as Rusty’s web-excusive series Identity, the two have explored the circumstances surrounding the cold case, and seek to finally find some resolution for Buzz and his family. So it seemed only natural for us to sit down with both Graham Patrick Martin and Phillip Keene together, to discuss Buzz and Rusty’s new partnership in crime-solving, and what we can expect from both of their characters moving forward this season. MCTV: This year has been a great year for both of you. Phillip, you’re having a great year with Buzz’s storyline, and Graham, Identity continues to be wonderful with Rusty as well as his storylines continuing. You’re about halfway through filming this season now – how has it been going for both of you? Phillip Keene: We’re finishing up episode 9 and things have been going great. I mean, Graham has always been excellent at memorizing dialogue – and quite frankly I haven’t had that much dialogue to memorize in such a long time that it was a bit of a challenge for me. But the more that I do it with these episodes of Identity, the easier it becomes. And I just love the fact that you get to see more of my character’s background, so it gives me a lot to do, and I love working with Graham. He and I did a four-page scene a couple weeks ago and we were able to get it filmed in under an hour – it was great! The crew were happy, we loved it, it was just nice playing off of somebody who works as well as he does. Graham Patrick Martin: Thank you Philip. I am a such a huge fan of the show, and I’ve always been a huge fan of the Buzz character, and so it’s been fun playing with that sort of brotherly relationship that Buzz and Rusty have always had. I’ve always been really anxious to dig deeper and to learn more about Buzz and what’s motivated him to be where he is. So that’s what this whole Identity Buzz and Rusty crossover has done for me. It’s really been an awesome platform to dive into the character of Buzz, who I feel like is one of the characters who we don’t know as much about as the others. It’s a warm June day in Hollywood, and Executive Producer James Duff is being pulled apart. Not literally of course, but as we are invited on set to interview Duff and watch the filming of an upcoming episode of Major Crimes, all plans for a traditional sit down with the executive producer/writer/creator of the show seem to go out the window when we arrive to find him and the cast and crew at full speed in the middle of production for the 5th season, premiering tonight at 10pm/9c on TNT. As the day progresses, the scope of just what being in the middle of the episode order really means becomes more and more clear. Bits and pieces of all seven of the season’s first episodes are in different stages of progress at the same time, all on the same day, and each piece has to be perfect. The cast is down on the soundstage filming the second-to-last day of episode 506. We first catch up with Duff when the cast takes a break to do the table read for episode 507. The read is running about 45 minutes late–the filming on the soundstage ran long. The actors are released from filming and start arriving, and the big conference room we’re in suddenly begins to feel very small as it fills. 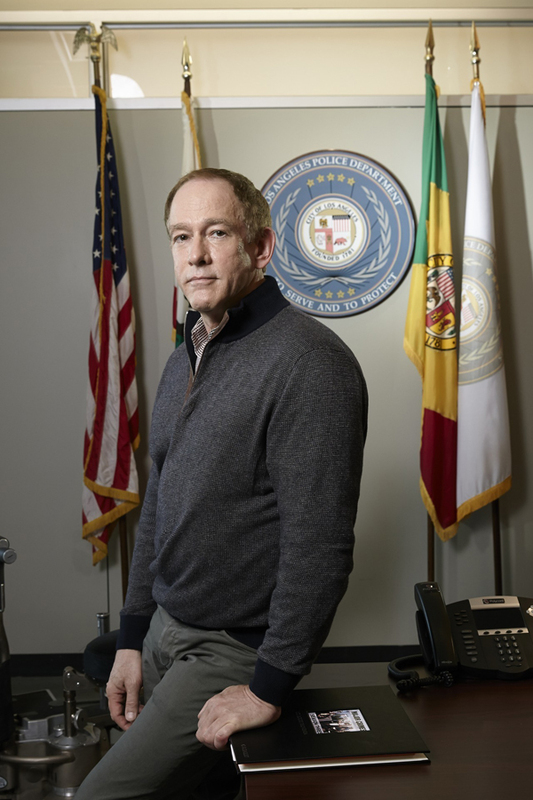 Four seasons into TNT’s hit series Major Crimes, viewers have developed a personal connection to the LAPD’s fiercely loyal Captain in the same way that her detectives have developed a devotion to her. For Raydor, family extends beyond the people with whom she shares bloodlines or family names. For Mary McDonnell, the chance to portray a woman of equal emotional and intellectual strength and integrity is a source of joy for her as an actress. 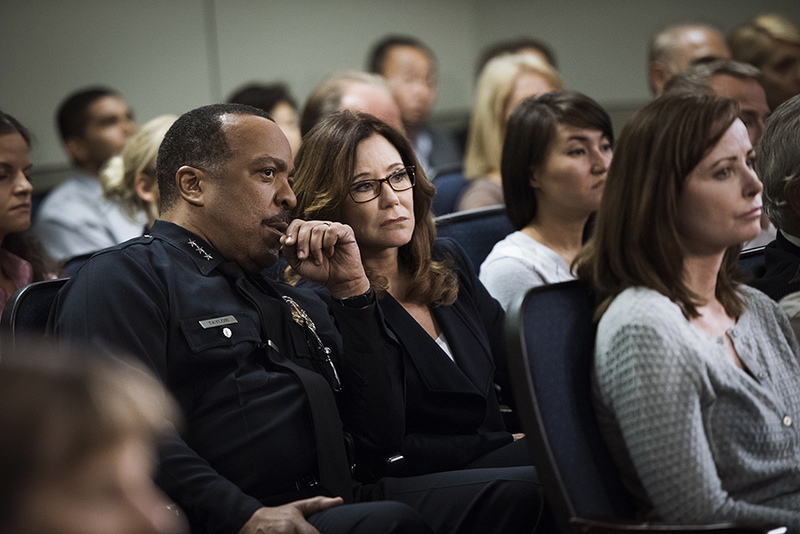 When we spoke to executive producer James Duff at the beginning of this season of Major Crimes, he discussed how the focus for this season centered around the theme of “courage”, and how that issue would reverberate through the lives of the characters. Catching up with Duff on the eve of the groundbreaking winter premiere, it’s clear that exploring the themes about courage was not only for the characters, but for the writers themselves as they embarked on a new structure for the series. 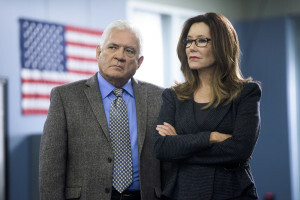 For the first time ever, Major Crimes will break from its procedural format to create a serialized arc out of the final five episodes of season four. 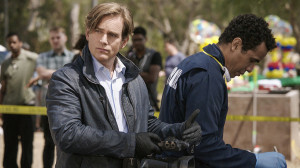 The decision to structure the season this way came after TNT increased Major Crimes season four episode order by five episodes for a total of 23 episodes, the biggest season order of any TNT series to date. Duff explains that he and the writers had just finished laying out their plans for the original 18 episodes of the season when the additional five were ordered. Instead of changing what had already been put into motion with the first part of the season, they opted to use the opportunity to try something completely different. Sykes isn’t the only supporting member of the cast who takes a more prominent role in the unfolding episodes. Despite an intense crime unfolding in the foreground of the episodes, in the first of the five episodes alone there are no less five of the main characters of the show for whom things begin to shift dramatically as the case and episodes unfold. 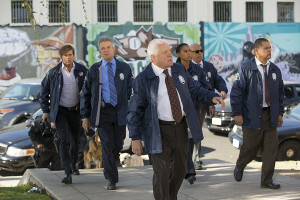 Major Crimes winter season premieres tonight at 9pm/8c on TNT. MCTV Exclusive: G.W. 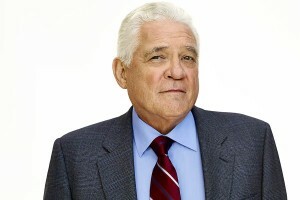 Bailey Talks Winter Season, Provenza’s Wedding Plans and More! MajorCrimesTV: You’re almost through filming this super-sized season of Major Crimes. Have you found there to be any unique challenges involved with the longer season? G.W. Bailey: Doing 23 episodes is definitely not an easy thing, and its been a little bit like trial by fire. At the same time though, it is a very unique experience. I have been playing this character for so many years, but I actually never did a long-term series prior to The Closer or Major Crimes, though I have been involved in a lot of different network shows over the years. Some of those either didn’t last very long, or I was simply a recurring character. So to now film 23 in a row is very trying; and it’s especially trying on the writers, as they’ve been working virtually non-stop this year, but it’s rewarding at the same time. It’s just a different sort of an experience for them, and for all of us working on the show. So doing more is always a challenge – mentally, emotionally, you just get tired. So yes it does have its challenges but in the great scheme of things, this is gravy; this is a great gig! It’s a safe place to work, good food, good housing, you know, it’s not a bad gig! MCTV: Not only is this season longer than any other that you have done previously, but the structure itself is very unique. Can you speak a little bit about what is different in this upcoming winter arc? G.W. Bailey: The writers are doing something that’s very new to us and that is a lot of fun for the final five episodes. They are a serial piece as opposed to a procedural piece, which of course means that there is one crime, or rather series of crimes, and they’re all connected to either a killer or a group of killers. We will be spending the entire final five episodes trying to solve those murders and bring that killer or killers to justice. Structuring the show in this way is a big first for us, so that’s been fun to explore. And the best part is that we (the actors) truly don’t know, or rather we won’t know the outcome until the final episode, so all of us on set have our own theories as to who it might be.